I get the feeling that Kathy Cano-Murillo is the real deal, without even having met her in person. You get what you…well, feel. That is, you can’t help but feel energized and creative when you come across anything that has been touched by Kathy. That is how reading her debut novel, Waking Up In The Land Of Glitter, has left me feeling—energized and creative. I admit I’m not a diehard crafter and I am not a perfectionist when it comes to crafting, I use what I have on-hand and don’t need much else. However, I do have five children, so crafting is a must. My family owns some crafting supplies, such as glitter, crazy scissors, pipe cleaners, clay, wax, glue, leather, feathers, stickers, jewels, marbles, popsicle sticks, beads, etc…; alright, so we are pretty diehard. Anyway, we craft together as a family event, just as the children have “game night” with daddy, the kids have “craft-time” with mama. Which leads me back to Kathy; I thought that crafting in our family was coming to an end as the kids were growing older and enjoying other more sporty activities. Waking Up In the Land of Glitter has changed that way of thinking. I am energized to keep my supplies and dedicate a weekend night to family crafting. Estrella, Ofie, Chloe, and Benecio have proven that there are no age limits, no gender limits, and especially no diehard thresholds for getting crafty and living an artful life. 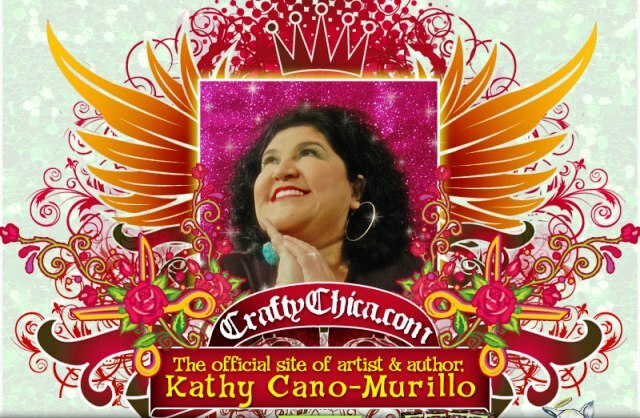 Kathy Cano-Murillo is a writer, artist, and craft product designer. It has been a pleasure to read her first novel and I look forward to more. Gracias, Kathy, for this interview. It has been a pleasure to get to know you and your creative process in writing and crafting. The Austin Times: I enjoyed reading your CraftyChica.com bio on “how it all came together,” as a young girl, what did you imagine your professional career to be? As a young girl, I always knew I would do something involved with writing and working in a creative environment. I used to love watching old movies where the father worked at an ad agency and had to come up with catchy campaigns and slogans. I loved the idea of brainstorming! I’ve always been into anything artful! English and Creative Writing were always my favorites and I always received good grades. I loved art class, but I never received anything above an average grade, so I had a stigma for a long time that even though I loved making things, I shouldn’t spend too much time on them if my teacher didn’t think I had talent. Eventually, I learned to take the rejection as motivation and prove those teachers wrong! In high school, I was on the newspaper and yearbook staff and enjoyed interviewing and sharing stories about interesting people. My dream was to become a features writer for our local paper, The Arizona Republic, and that came true! TAT: Who have been your role models? Any mentors? My dad has always been a strong role model in the way he loved to juggle several opportunities at once. He worked a full-time job during the day, fixed cars at night, rebuilt cameras, cars, bikes, computers, and watches on the weekends. He made the most of every day. Also my mom, she has always been about self-discipline. I’ve never really had a specific mentor, but I draw inspiration from many people I’ve encountered. On a local level, my role models are people who are active in making our community a better place, on a bigger level, anyone who is about positivity, and most of all – those who triumph over adversity. I love rooting for the underdog! TAT: Has writing been as much fun as creating pop art? How do you balance your creating “career” with your writing “career”? Is it possible to “have it all”? YES! I love both of them equally! To me, writing is another form of art. My blank screen is the canvas and the nouns and verbs are the paints and embellishments. I love to split my day into half crafting and half writing. I work full-time on CraftyChica.com stuff, and then after everyone goes to bed in the house, I switch over to writing. Writing is calmer, less messy. Crafting is a blast because it is so tangible, and I like that I can start and finish something fabulous in a short amount of time. Both are ways to express emotion and tell a juicy story. TAT: What was your creative process for this novel? Did you incorporate a little bit of yourself, your life experience, in the novel? What character would you say most resembles you? I went through many creative processes for this book. Too many to count! I tried everything from making shadowboxes for my characters to art journals to fancy decorated index cards. But the bottom line – what worked – was an outline, growing roots in my chair, and just writing. I wrote the first draft for National Novel Writing Month, I just let it all come out. And then I went in and edited all of it. Later on, I trimmed out two characters (about 50-60 pages) and used that space to go more in-depth with my main characters. My editor helped me with that and it is the best decision I ever made! All of the characters have a little bit of me in them. Star is who I was when I first decided I wanted to go into art. I was very critical and snooty back then. Ofie is me when I REALLY discovered I loved crafts. I went overboard on everything. I could look at a straw wrapper and think of something to make with it, so then I’d start to collect straw wrappers far and wide. And Chloe is about discovering the world of “professional crafting.” I never stole anyone’s ideas, but I can relate to her wanting to make it so bad, and wanting to jump through the hoops to look good. I also wanted to show contemporary Latina crafters who scrapbook, paint, sew, crochet, and knit. The craft industry is $31 billion dollar industry. Latinas, like me, are a big part of that! It was also important to me for the book to come out during National Craft Month (March). I want for book readers to give crafting a try, or for crafters to get into fiction – and both into forming groups! TAT: Your second novel, Miss Scarlet’s School of Patternless Sewing, is in the editing stage, can you tell us anything about it? Yes, it is about a young woman, kind of a Latina-esque Katy Perry, who comes from a family of engineers. She is very smart and has great job offers, but her heart is set on fashion design. She runs a popular blog dedicated to her idol, a fashion designer from the 1960s. It has a hint of mystery to it and takes place in Glendale, AZ, Miami, FL, and NYC! I think of this book as a Willy Wonka and the Chocolate Factory-meets-Real Women Have Curves! TAT: Anything else that you would like to share with readers? I truly believe that writing and art are cousins of creativity. If you need to kick up your writing, dabble in art journals or shadow boxes. If you are an artist who loves to tell stories, try transferring that energy into the written page. It is so rewarding and will help you exercise new creative muscles you never knew you had!